Watching the appeal and applications of machine intelligence expand. At the same time, the hype around machine intelligence methods continues to grow: the words “deep learning” now equally represent a series of meaningful breakthroughs (wonderful) but also a hyped phrase like “big data” (not so good!). We care about whether a founder uses the right method to solve a problem, not the fanciest one. We favor those who apply technology thoughtfully. What's the biggest change in the last year? We are getting inbound inquiries from a different mix of people. For v1.0, we heard almost exclusively from founders and academics. Then came a healthy mix of investors, both private and public. Now overwhelmingly we have heard from existing companies trying to figure out how to transform their businesses using machine intelligence. Machine intelligence business models are going to be different from licensed and subscription software, but we don't know how. Unlike traditional software, we still lack frameworks for management to decide where to deploy machine intelligence. Economists like Ajay Agrawal, Joshua Gans, and Avi Goldfarb have taken the first steps toward helping managers understand the economics of machine intelligence and predict where it will be most effective. But there is still a lot of work to be done. Established players like Conservation Metrics and Vulcan Conservation have been using deep learning to protect endangered animal species; the ever-inspiring team at Thorn is constantly coming up with creative algorithmic techniques to protect our children from online exploitation. The philanthropic arms of the tech titans joined in, enabling nonprofits with free storage, compute, and even developer time. Google partnered with nonprofits to found Global Fishing Watch to detect illegal fishing activity using satellite data in near real time, satellite intelligence startup Orbital Insight (in which we are investors) partnered with Global Forest Watch to detect illegal logging and other causes of global forest degradation. Startups are getting into the action, too. The Creative Destruction Lab machine intelligence accelerator (with whom we work closely) has companies working on problems like earlier disease detection and injury prevention. One area where we have seen some activity but would love to see more is machine intelligence to assist the elderly. A massive thank you to the Bloomberg Beta team, David Klein, Adam Gibson, Ajay Agrawal, Alexandra Suich, Angela Tranyens, Anthony Goldblum, Avi Goldfarb, Beau Cronin, Ben Lorica, Chris Nicholson, Doug Fulop, Dror Berman, Dylan Tweney, Gary Kazantsev, Gideon Mann, Gordon Ritter, Jack Clark, John Lilly, Jon Lehr, Joshua Gans, Matt Turck, Matthew Granade, Mickey Graham, Nick Adams, Roger Magoulas, Sean Gourley, Shruti Gandhi, Steve Jurvetson, Vijay Sundaram, Zavain Dar, and for the help and fascinating conversations that led to this year’s report! Landscape designed by Heidi Skinner. Disclosure: Bloomberg Beta is an investor in Alation, Arimo, Aviso, Brightfunnel, Context Relevant, Deep Genomics, Diffbot, Digital Genius, Domino Data Labs, Drawbridge, Gigster, Gradescope, Graphistry, Gridspace, Howdy, Kaggle, Kindred.ai, Mavrx, Motiva, PopUpArchive, Primer, Sapho, Shield.AI, Textio, and Tule. 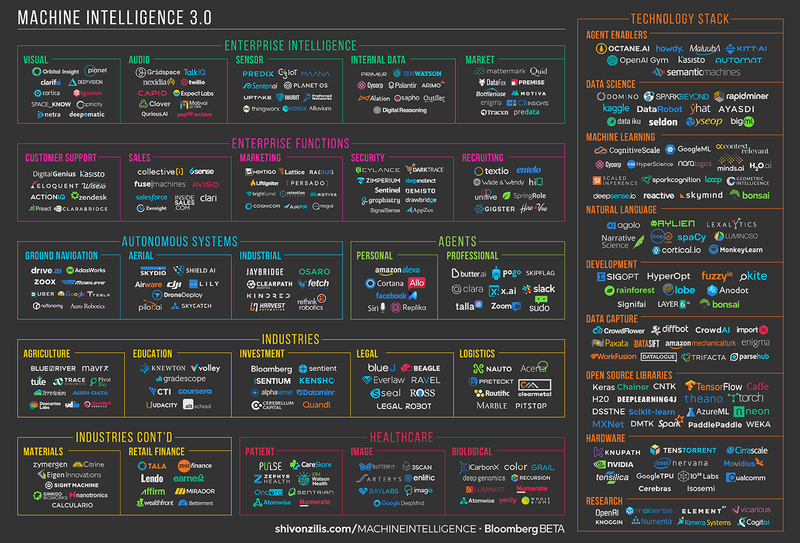 Article image: The current state of machine intelligence 3.0. (source: Image courtesy of Shivon Zilis and James Cham, designed by Heidi Skinner). James Cham is a Partner at Bloomberg Beta based in Palo Alto. He invests in data-centric and machine learning-related companies. He was a principal at Trinity Ventures and Vice President at Bessemer Venture Partners, where he worked with investments like Dropcam, Twilio, and LifeLock. He's a former software developer and management consultant. He has an M.B.A. from the Massachusetts Institute of Technology and was an undergraduate in computer science at Harvard College.